You can’t really win an argument. “The raconteur mentioned that the quotation was from the Bible. He was wrong. I knew that. I knew it positively. There couldn’t be the slightest doubt about it. And so, to get a feeling of importance and display my superiority, I appointed myself as an unsolicited and unwelcome committee of one to correct him. He stuck to his guns. What? From Shakespeare? Impossible! Absurd! That quotation was from the Bible. And he knew it. “’Yes, of course,’ he replied. ‘Hamlet, Act Five, Scene Two. But we were guests at a festive occasion, my dear Dale. Why prove to a man he is wrong? Is that going to make him like you? Why not let him save his face? He didn’t ask for your opinion. He didn’t want it. Why argue with him? Always avoid the acute angle.’ The man who said that taught me a lesson I’ll never forget. I not only had made the storyteller uncomfortable, but had put my friend in an embarrassing situation. How much better it would have been had I not become argumentative. “I have come to the conclusion that there is only one way under high heaven to get the best of an argument – and that is to avoid it. Avoid it as you would avoid rattlesnakes and earthquakes. You can keep a disagreement from becoming an argument. Here are some suggestions towards that end. “Welcome the disagreement. Remember the slogan, ‘When two partners always agree, one of them is not necessary.’ If there is some point you haven’t thought about, be thankful it is brought to your attention. Perhaps this disagreement is your opportunity to be corrected before you make a serious mistake. “Distrust your first instinctive impression. Our first natural reaction in a disagreeable situation is to be defensive. Be careful. Keep calm and watch out for your first reaction. It may be you at your worst. “Control your temper. Remember, you can measure the size of a person by what makes him or her angry. “Listen first. Give your opponent’s chance to talk. Let them finish. Do not resist, defend, or debate. This only raises barriers. Try to build bridges of understanding. Don’t build higher barriers of misunderstanding. “Look for areas of agreement. When you have heard your opponents out, dwell first on the points and areas on which you agree. “Be honest. Look for areas where you can admit error and say so. Apologize for your mistakes. It will help disarm your opponents and reduce defensiveness. “Promise to think over your opponents’ ideas and study them carefully. And mean it. Your opponents may be right. “Thank your opponent’s sincerely for their interest. Anyone who takes the time to disagree with you is interested in the same things you are. Think of them as people who really want to help you, and you may turn your opponents into friends. Sigh. And I do love to debate. But I need to watch myself, based on this information. 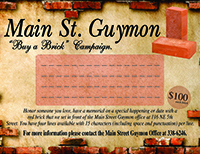 One thing not to argue about is that there are some great things happening this month in Guymon. L&M Arena is holding their Play Days on the 21 and 28 of June; there is a Senior Citizen Dance on June 17; there’s a Community Health Forum on June 21; a Medicare Seminar on June 22; a PTCI Gig Party on June 23; and the Chamber has their golf tournament on the 24th. And there’s still more that we’ll list later! See you on the bricks!! !